IN-LINE circulating pumps, suitable for civil and industrial systems of heating, conditioning and sanitary hot water. 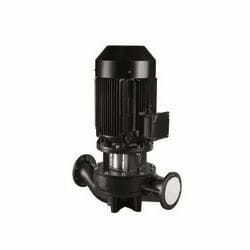 The range has simple and twin pumps both with two-pole ans four pole Pump body and motor support in cast iron. Flanged suction and discharge nozzles PN 16, with threaded holes for control pressure gauges. Monobloc centrifugal pumps according to EN 733 - DIN 2455 designed for liquid transfer from -10ºC to 90ºC. Manufactured entirely in cast iron for continuous operation.